The biggest surprise for anyone is to swing open their door in the morning to find a gift waiting for them. 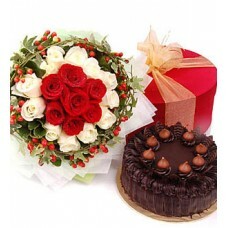 Send her this beautiful bouquet of 12 champagne roses with berries to greet her in the morning.With Mocha Choco Crumble by Red Ribbon Regular Size (8" Diameter-Round). Optional: Red/White/Pink/Yellow/Orange color roses available on request. This order Requires 2 days lead time Your purchase includes a complimentary personalized gift message. 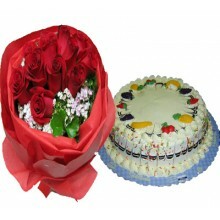 This bouquet consists of 12 Red Roses, ‘Sweet William’ and greenery is specially design to look extremely elegant. 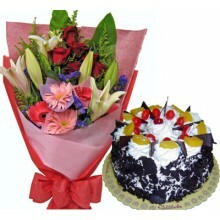 This bouquet will add a magical charm and a smile to the recipient. Perfect for Farewell, Thank You, Best Wishes or A Job Well Done. With Fruity Marble Cake by Goldilocks Size: 9 Rounds (9" Diameter) This order Requires 2 days lead time Your purchase includes a complimentary personalized gift message. 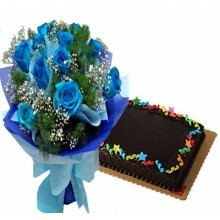 This beautiful bouquet of sprayed 12 blue roses expresses your thoughts. It’s perfect for friendship & romance. Whatever the reason for celebration, this will let them know just how special they are in your life! With (8" x 12" Rectangular) Chocolate Cake by Red Ribbon. This order requires 3 days lead time Your purchase includes a complimentary personalized gift message. From my heart, I promise you my eternal love. Nothing will ever sway my affections for you. May these 12 pure white roses that symbolize my deep ardor for you are a testament of my devotion & faithfulness? I am yours to hold and to have. 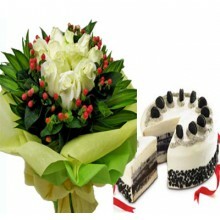 With (8" Diameter-Round) Cookies and Cream Cake by Red Ribbon This order Requires 2 days lead time Your purchase includes a complimentary personalized gift message. Wow...48 pink roses with foliage, sure to make a lasting impression to your special love. Pink roses signify gratitude and a mark of eternal love. Optional: Red/White/Champagne/Yellow/Orange color roses available on request. With 9 diameter round Fruity Choco Cake by Goldilocks Please Note: This product is available only within METRO MANILA This order Requires 2 days lead time Your purchase includes a complimentary personalized gift message. Make a strong declaration of LOVE with 50 passionate red roses bouquet. This is the perfect way to express your thought & best wishes. It will make a heart-warming statement of affection. 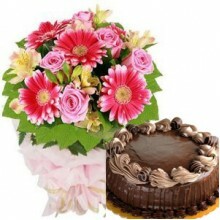 with Chocolate Mousse Cake by Goldilocks Size: * dia round. This order Requires 3 days lead time Your purchase includes a complimentary personalized gift message. Nicely wrapped 10 to 12 Pcs. 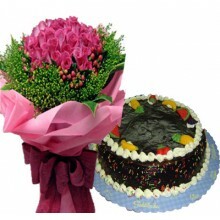 Seasonal Flowers Bouquet with Fresh Double Dutch Cake 9 Rounds (9" Diameter)by Goldilocks Two layers choco chiffon and marble chiffon cake with choco buttercreme filling and mini chocolate chips. It is iced with fudge frosting, choco buttercreme border, and chocolate coated mallows. This order Requires 2 days lead time Your purchase includes a complimentary personalized gift message. 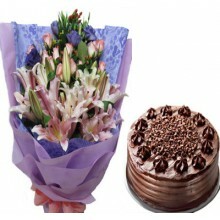 Send a lovely mixture of pink lilies, gerberas and red roses hand bouquet with a gesture of appreciation with Petite (6" Diameter) Black Forest Cake by Goldilocks to say “Thank you” to someone special. This order Requires 1 day lead time. Your purchase includes a complimentary personalized gift message. Be it to applaud a stunning performance or celebrate a jubilant occasion, this is a presentation bouquet accompanied of 1 dozen pink lily with 1 dozen light pink roses with some greeneries that’ll stand out like a celebrity. 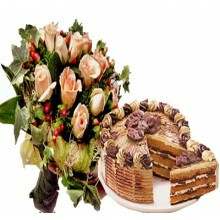 She'll be thrilled by your compliments when she receives this exceptional bouquet that mirrors her class. With Ultimate Chocolate Cake by Red Ribbon Regular Size (8" Diameter-Round) Please Note: For the Provincial Cakes Delivery, Pinasflower,reserves right to cancel or request for pick-up any order if delivery address is out of coverage area. This order Requires 2 days lead time Your purchase includes a complimentary personalized gift message.